Muscat, Oman is an unusual setting for an MG book. A bustling city of 3.6 million, its situated on the shores of the Arabian Sea. The country of Oman borders United Arab Emirates (Dubai), Saudi Arabia, and Yemen. 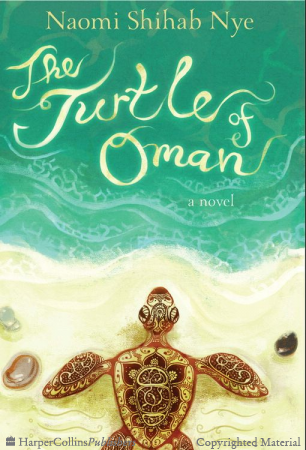 THE TURTLE OF OMAN is a quiet story with a hopeful message about a boy who is relocating to Michigan for three years with his parents. He is hurt by the thought of leaving behind his cat and beloved grandfather and fearful he will not like his new community or school. A sequel would be welcome as this story covers only the time leading up to young Aref’s flight to the U.S. Like another recent book about moving, MY LIFE IN DIORAMAS, this one explores what a child does to makes sense of a potential move. With short chapters and text that is spaced for easy reading, the page count is not to be feared. It’s a quick read. FULL PLOT (From Amazon): Aref Al-Amri does not want to leave Oman. He does not want to leave his elementary school, his friends, or his beloved grandfather, Siddi. He does not want to live in Ann Arbor, Michigan, where his parents will go to graduate school. His mother is desperate for him to pack his suitcase, but he refuses. Finally, she calls Siddi for help. But rather than pack, Aref and Siddi go on a series of adventures. They visit the camp of a thousand stars deep in the desert, they sleep on Siddi’s roof, they fish in the Gulf of Oman and dream about going to India, and they travel to the nature reserve to watch the sea turtles. At each stop, Siddi finds a small stone that he later slips into Aref’s suitcase—mementos of home. The relationship Aref has with his grandfather is touching. It is Sidi who helps Aref say good-bye to his native land. Boat trips, camping, and enjoying their final days together provides the perfect sendoff. Aref writes in his notebook so he won’t forget. He writes about the wildlife he adores and any other topic that moves him. His writing pieces are done in a font to reflect his own penmanship. It doesn’t matter what country you live in – you will recognize the themes of fear, family, and the anxiety of starting over. Aref has feelings similar to young people in our own culture and is a boy who’d be a joy to have in any neighbohood. It takes the entire book for Aref to pack his suitcase. What he finally takes with him is the basis for this touching story. Perhaps best as a read-aloud, this tale would be great in a discussion about our perceptions of different cultures. FAVORITE LINES: Sometimes, even though he was old, Aref walked backwards swinging his arms, making a back-up beep, like a bulldozer or truck would make. You saw differently when you walked backwards… Would he feel backwards in Michigan or just the same as he felt in Oman? 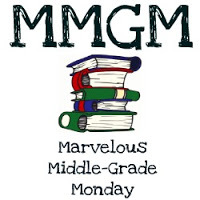 This entry was posted in Reviews and tagged Marvelous Middle Grade Monday, MG book reviews, Middle grade, Naomi Shihab Nye, THe Turtle of Oman. Bookmark the permalink. Sounds like a really great read. And I love reading books set in different countries. This was an interesting book, but perhaps better for elementary school. I can’t get my students to read it, but I wish they would. Yes, I’ve read many quiet books like this one that students won’t touch. Most want funny or an adventure. I like the focus on moving and starting over, which is always hard on kids/teens. I think in terms of military kids who are always on the move. Will check this out. Sounds interesting. I won a copy of this a couple months ago and it is in my stack to read. Thanks for this review. Since it’s a quick read, maybe I can get to it soon. You make it sound very inviting. Thanks for the post. Yes, but I think more inviting for adults. We often don’t like the same books as those 8-12 year olds. I’m not familiar with this book but it sounds like a gem. I like that the themes are universal, yet the reader learns something about a different culture. The cover really drew me in, but also the story. It sounds very emotional and touching, and I especially like that it’s set in a country not very familiar to me. Thanks for featuring this!